Lausanne (pípè ní Faransé: [loˈzan]) is a city in Romandy, the French-speaking part of Switzerland, and is the capital of the canton of Vaud. 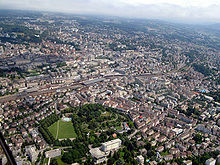 The seat of the district of Lausanne, the city is situated on the shores of Lake Geneva (Faranse: Lac Léman). ↑ Clarey, Christopher. "Introduction to Lausanne". The New York Times. http://travel.nytimes.com/travel/guides/europe/switzerland/lausanne/overview.html?st=cse&sq=Lausanne&scp=3. Retrieved 2008-04-20. Àtunṣe ojúewé yi gbẹ̀yìn wáyé ni ọjọ́ 4 Oṣù Kejì 2015, ni ago 21:10.